‘Until you have a first-hand experience dealing with the systems in other countries, you will never realise that Sydney offers the best lifestyle and business environment,’ says successful businessman Ricky Fertig, who recently migrated to Sydney from South Africa. According to Ricky, the decision to live and invest in NSW was an easy one. After spending many holidays in Australia over the years, he saw an opportunity to improve the quality of life for his family. ‘NSW has a first-world environment and offers a better future for my children,’ Ricky explained, and so in 2012, he decided to migrate to NSW under the state-nominated Business Innovation Stream (Provisional) 188 visa. It was on a cruise back from the rugby World Cup in New Zealand, 2011, that Ricky and his wife Lucy decided this is where they wanted to bring their family to live. ‘We came in through Sydney Heads in the morning and my wife and I were taken with the beauty of Sydney Harbour. We knew this was where we wanted to be’. It was shortly afterwards that Ricky started his first business venture in Australia by acquiring a 50% share in Soudis Australia Pty Ltd. He continued this business until his provisional visa was granted. 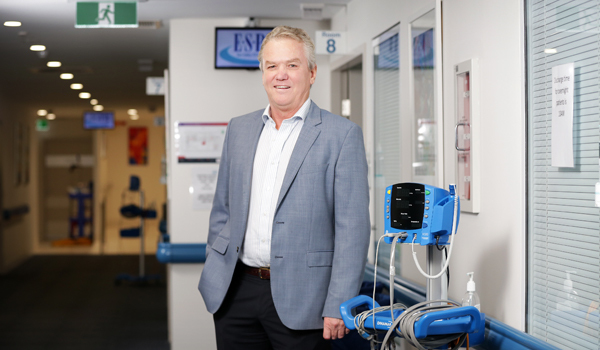 In May 2013, Ricky decided that he wanted to focus on a larger opportunity, and co-established the East Sydney Private Hospital Pty Ltd (ESPH) in Woolloomooloo. Later that year, he sold his shares in Soudis to concentrate on the hospital. He considers ESPH to be his first major venture in Australia but is already busy with others. To date, more than $30 million have been invested in the hospital, which employs more than 50 full-time staff. ‘There is no shortage of surgeons in Sydney and Sydney is a great destination for health professions, attracting skilled people from all over the world,’ Ricky said. ESPH is growing quickly and now performs over 450 operations a month, ranging from plastic surgery, orthopaedics, ear, nose and throat surgery and ophthalmology. The hospital has 18 beds and five operating theatres in its beautifully positioned East Sydney location. Ricky says, ‘I don’t see myself living anywhere else. The people in Sydney are friendly and the business environment is well-regulated, stable and efficient, all of which makes doing business so much easier’. Although he is still an ardent supporter of the South African national sporting teams, Ricky has immersed himself in Australian culture and enjoys watching AFL, as well as getting out on the harbour with friends.